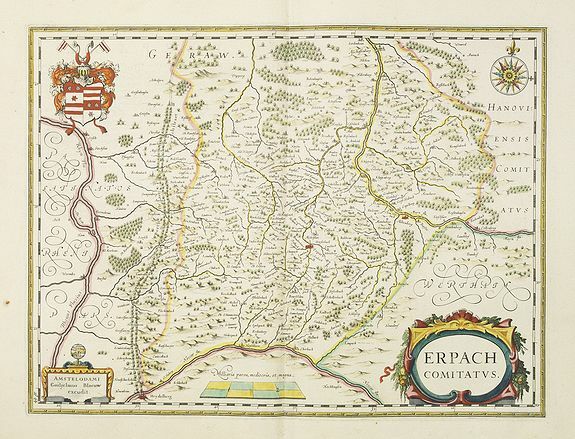 BLAEU, W. - Erpach Comitatus. Erpach Comitatus. - BLAEU, W.
Size : 14.0 x 18.7 inches. / 35.5 x 47.4 cm. Description :Elegantly engraved map of the region including Heidelberg, centered on Eparch and showing part of the River Rhine and River Main with the towns of Gensheim, Worms, Miltenberg and Oldenburg. The mountainous topography is graphically depicted and there is a coats of arms in the corner of the map. Condition : Very good condition. Printed on heavy paper.